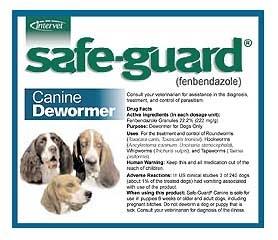 Safe-Guard granules is a powerful intestinal dewormer for dogs. Recommended for the removal of Ascarids, Hookworms, Whipworms and Tapeworms. Similar to prescription formulas, can be used in young puppies, debilitated dogs, pregnant females and heartworm-infected dogs. Provides 100 percent whipworm control and eliminates nearly 100 percent of hookworms and ascarids. Stable for 30 months at room temperature. No know drug interactions. Safe-Guard is easy to administer and offers up to 6 months of protection between treatments.